Competition breeds innovation and this is why we are happy that there is more than just one big dog on the block when it comes to interlocking garage floor tiles. To illustrate, Swisstrax Flooring, one of the industry’s premier manufacturers of plastic interlocking floor tiles, has recently updated a large segment of their popular garage flooring line with some stunning new styles and more integrated sizing. 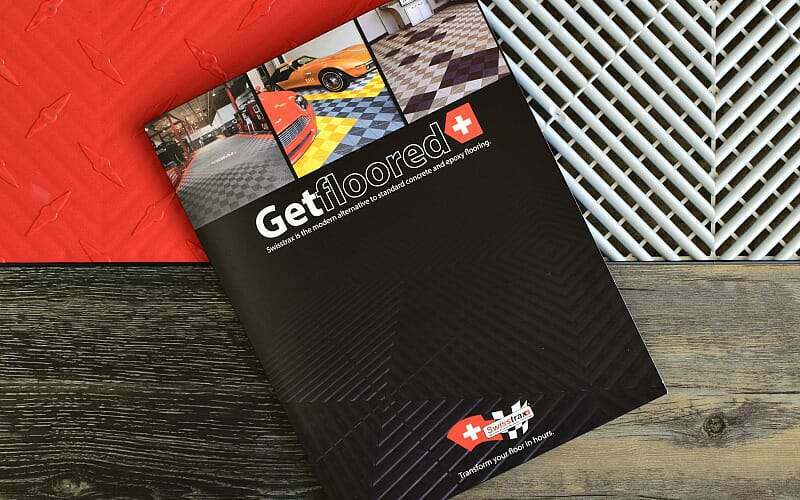 If you are new to the various tile options that are now available for garage floors, you may be surprised to learn that interlocking garage tiles are one of the fastest growing segments of this market — and for good reason. 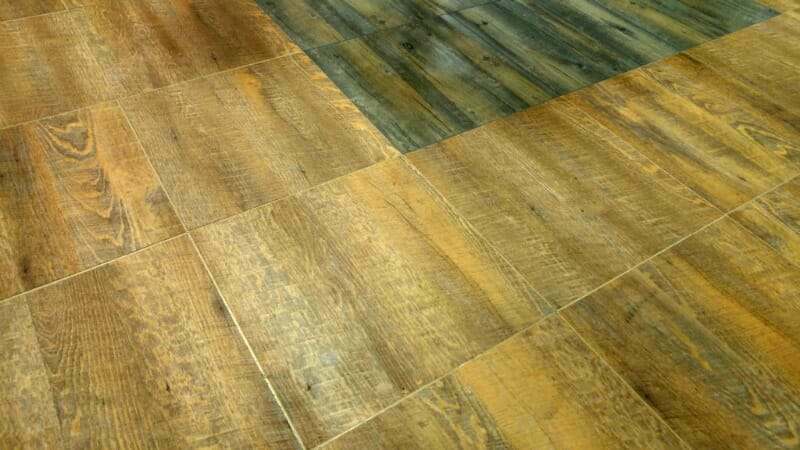 Not only do they do a good job of providing for a durable and stain resistant floor, they are also one of the easier flooring products to install and with perhaps the largest selection of colors and styles to choose from. Swisstrax and their chief competitor RaceDeck, a division of SnapLock Industries, are arguably the industry leaders of interlocking garage flooring. In fact, due to the many questions we had received regarding these two companies, we did a tile review and comparison between the two a few years ago. You can read about our findings here. 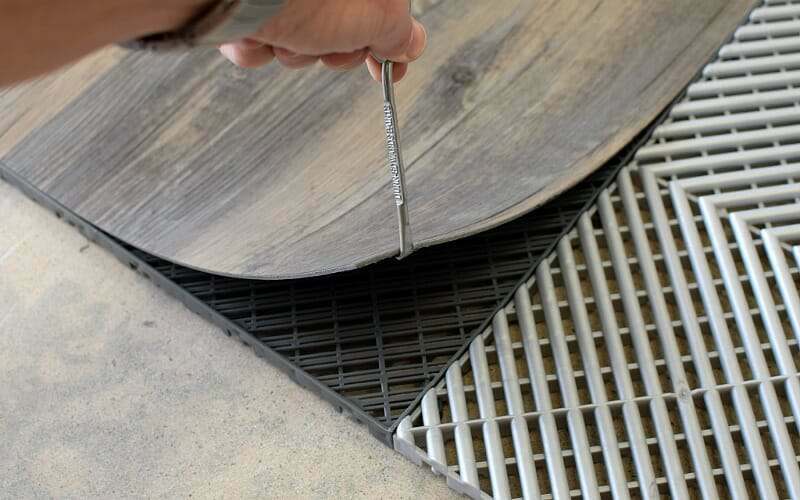 While both of these manufacturers measured up fairly well against each other at the time, our biggest gripe about Swisstrax was that the Ribtrax self-draining tile, by far the most popular design in their lineup, could not physically connect up with any of the other Swisstrax tiles due to its larger size. The Ribtrax tile is 15.75”x15.75” square and .75” thick, while the remaining Swisstrax lineup at the time was 13”x13” square and .50” thick. This single variance was disappointing and gave RaceDeck an advantage in terms of mixing various tile designs for function as well as cosmetic styling. If you liked the Ribtrax tile, you had no choice but to use only that tile design throughout your entire garage floor. So what did Swisstrax change? Earlier this year, Swisstrax introduced the adoption of the larger polypropylene platform of their very popular RibTrax tile for the majority of their garage tile line. The two exceptions to the new sizing are the Cointrax and Floortrax tile. At this time, they still remain a 13”x13” sizing. Hopefully these particular tiles will soon be following suit. This means that you can now mix the popular Ribtrax tile with many other tile designs in their lineup since they are the same size. It also means that you will gain the benefit of an even more durable and stronger rated floor — but we will talk more about that shortly since Swisstrax didn’t stop there. 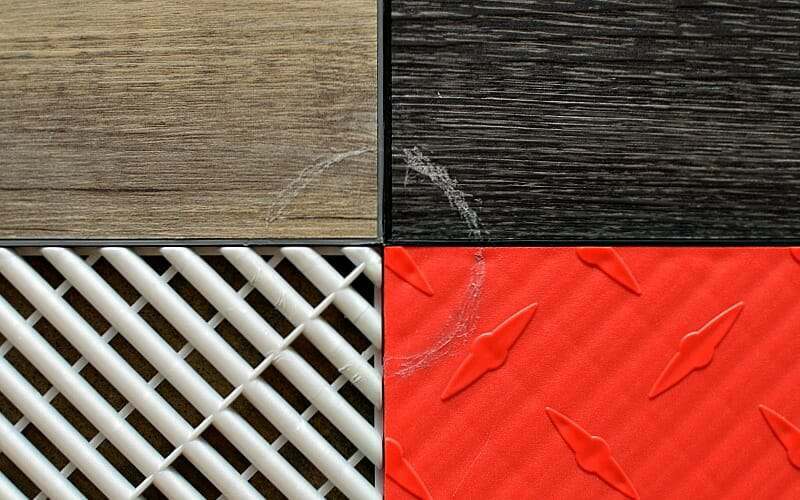 Included with this announcement, they also introduced some exciting new tile designs along with a design change to their DiamondTrax flooring tile as well. These new interlocking tile designs are going to generate numerous creative options, many of which are brand new to the market. The first of these new tile designs is called Vinyltrax. What Swisstrax did was create a variety of tough, premium vinyl inserts of different patterns and designs. 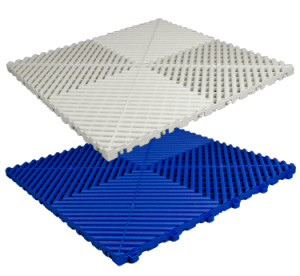 These inserts are then integrated into the larger 15.75”x15.75” polypropylene interlocking base structure in order create a completely new look. What this has done is allow Swisstrax to create a completely new line of tiles based on the larger platform. 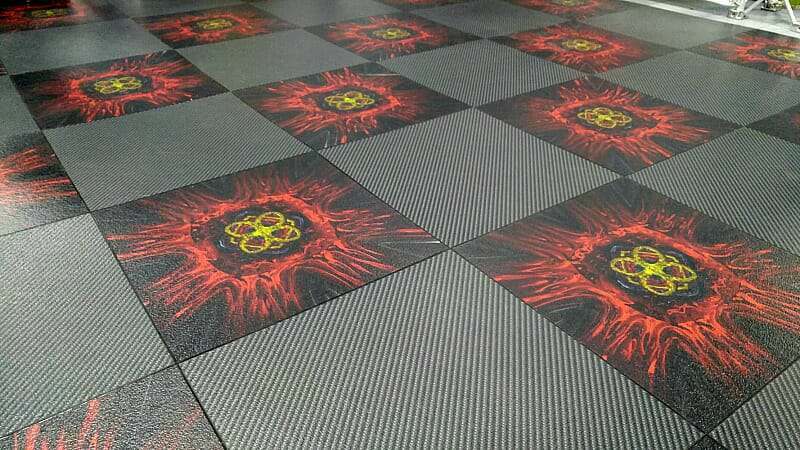 This will allow you to customize your garage floor in ways that, up until now, were not possible. The first of these we like to call their wood grain series. It consists of five different simulated wood grain design patterns that look like wood plank flooring. Your choices are Black Oak, Dark Oak, Medium Maple, Light Maple, and our personal favorite, Reclaimed Pine. The tiles actually have a texture to them that feels similar to wood. Not only does it provide an attractive appearance, it also creates a nice non-slip surface. We were pleasantly surprised by the striking looks of the wood design and were already visualizing the different ways in which to incorporate this look into a garage, laundry room, showroom, or some other work space. Not only can you run the same wood design throughout, some of these colors and grains complement each other and would look nice in a checker board pattern or some other creative layout. Did someone say Carbon Fiber? That’s right! Also included in the Vinyltrax line and due for release in December 2016, is their carbon fiber garage tiles. 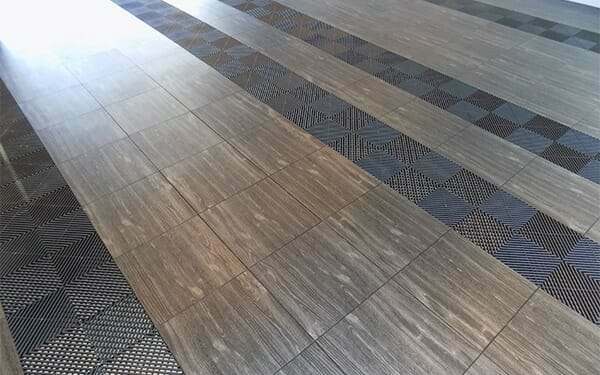 Just like the wood grain series, these tiles consist of simulated carbon fiber vinyl inserts that are laid into the larger 15.75”x15.75” polypropylene interlocking base tile. 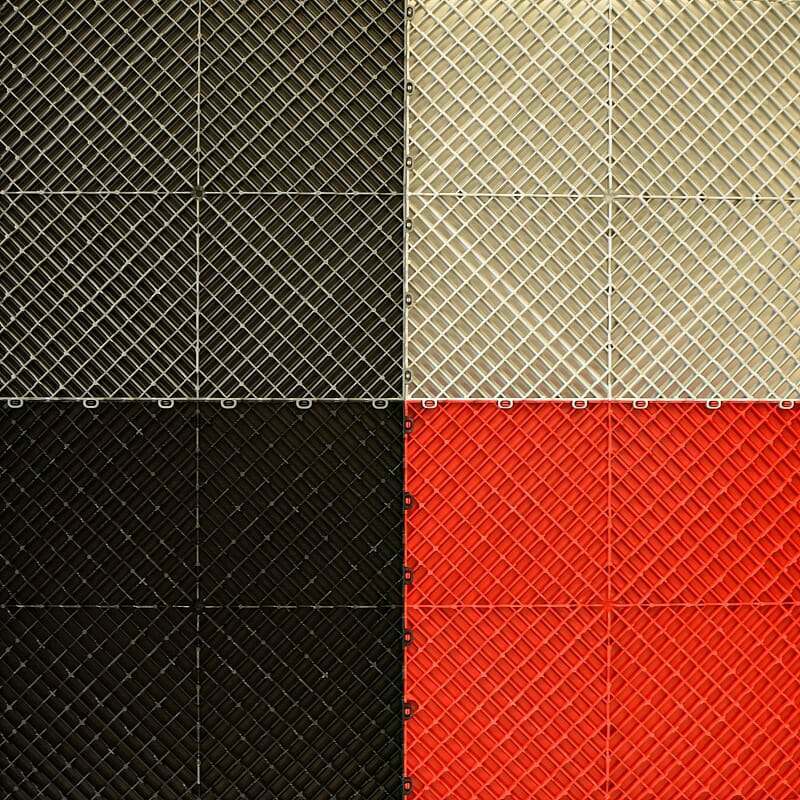 Available in black carbon and red carbon textures, this interlocking tile is sure to be a hit in many garages. It can make for a nice design accent or highlight a particular area of the garage floor. Unfortunately, we were not able to obtain samples of these since they have not been released yet. Due out in December as well, Swisstrax has also included a glossy black and glossy white interlocking tile into the Vinyltrax lineup. We feel that this is going to provide for a great alternative to those who want the look of the classic black and white checkered VCT garage floors, but do not want to deal with the requirements of VCT tile installation. Of course the advantage with this is that an interlocking garage floor system can be installed in a few hours where as VCT tile can take upwards of a few days. There is also the added benefit of not having to wax and buff the floor as part of a regular maintenance routine. We feel that this could potentially be a popular option for Swisstrax. As soon as samples are available, we will post pictures and do a review of these new Swisstrax tiles. Vinyl is very resistant to most stains, including oil and other chemicals. Vinyltrax is no different. 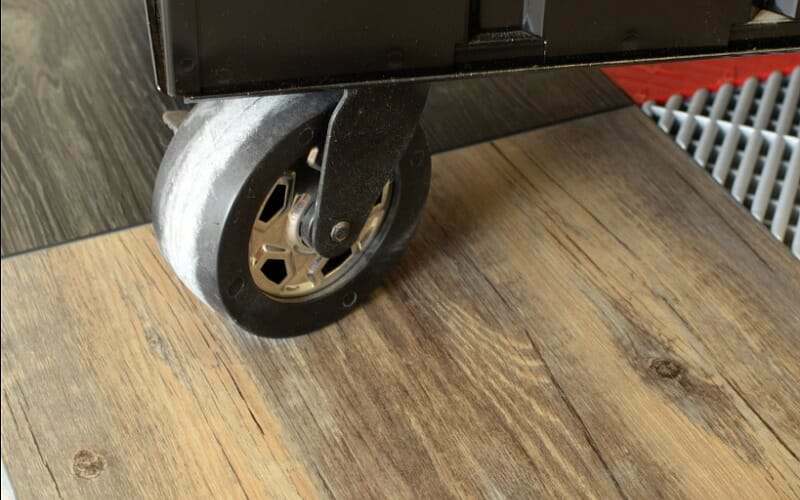 However, one of the first questions we asked Swisstrax when reviewing these new tiles was how susceptible are the vinyl inserts to tire stains? The reason we posed this question is that vinyl garage flooring has a history of developing tire stains where cars park on it. Garage floor mats are a good example. Swisstrax admitted that unlike the rest of their polypropylene topped tiles, the Vinyltrax tile is not tire stain proof. However, it is more resistant to tire stains than other vinyl garage flooring products. They were also quick to point out that just like garage floor mats; the darker colors are much less noticeable if staining does occur. We know this is true ourselves and have always recommended darker colors when tire stains are a concern with vinyl garage flooring. They also suggested that if you are a little creative you can always combine some of the polypropylene tile designs such as Ribtrax or Diamondtrax with the Vinyltrax line. Since these do not stain from car tires, you can place them where your car tires tend to park or use them as runners. How durable are the vinyl inserts? 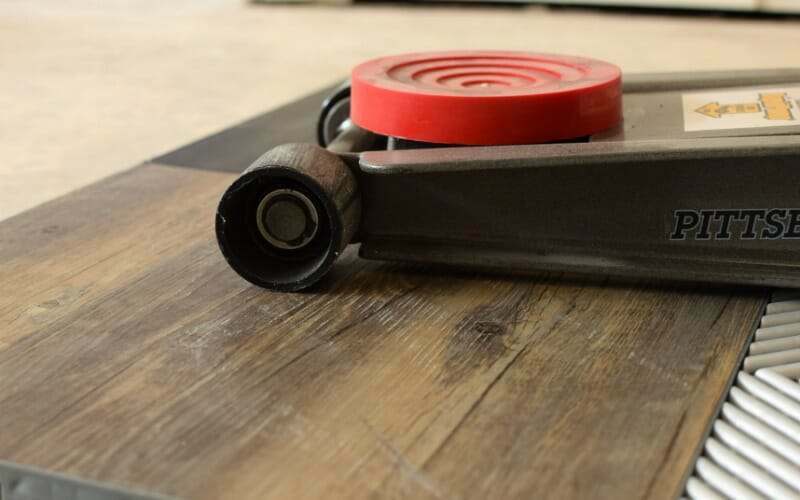 We know from experience that the standard polypropylene topped tiles are extremely durable and resistant to scratching unless you drag a heavy sharp object across the surface. Since vinyl is inherently softer relative to polypropylene, we wondered how these may hold up in a garage environment. With this in mind, we decided to do some informal testing on the Black Oak and Reclaimed Pine Vinyltrax tiles that we ordered as samples. We snapped them together along with some other SwissTrax tiles that we have in order to provide a nice platform. We then slid the steel wheels of a 3-Ton floor jack back and forth across the surface a few times. We also rolled a tool box that weighs well over 350lbs across the tiles. We were sure to move it in small circles and semi-circles in order to get the casters to change direction in one spot. Both the jack and the tool box had concrete grit on the wheels which is known to be abrasive. In addition to this, we ran the edge of a flat blade screw driver across the face of the Vinyltrax tile using moderate pressure. I must admit that I was fairly confident we would do some type of cosmetic damage to the surface, particularly with the floor jack wheels. It was just a matter of how much. To our surprise, however, we didn’t uncover any obvious cosmetic damage to the tiles with this type of informal testing. If you click on the images above you can see white marks on the tile from the concrete residue left by the jack wheels. We thought for sure there would be obvious scratches from sliding the jack wheels back and forth. However, the white marks wiped right off with a cloth and did not reveal any noticeable damage. What we did afterwards was purposely gouge the Vinyltrax tile with the screwdriver to see what a good scratch may look like. It took more effort than we thought it would. As we suspected, once you penetrate past the colored print surface of the Vinyltrax, the affected area takes on a whitish appearance. For comparison’s sake, we actually gouged a full circle that encompassed two Vinyltrax tile, a Diamondtrax, and a Ribtrax tile. What’s interesting to note is that the Ribtrax tile was by far the hardest to gouge due to the fact that none of the surface areas on the tile is actually flat. This is one reason why self-draining tiles are the easiest to keep clean and the hardest to incur damage that stands out. One clear advantage of interlocking garage tiles that we want to point out is that it’s very easy to just replace the affected tile. What is unique to the Vinyltrax line is that as long as the polypropylene base is not physically damaged, such as a possible tire stain, you can just replace the vinyl insert! This is even less expensive than replacing the complete tile. The insert can be replaced by wedging a paint can opener or flat bladed screwdriver between the insert and the edge of the polypropylene base. Once you do that, just lift up so that you can get your fingers under the insert and firmly pull it off the tile base. The new insert has pressure sensitive glue on the back side. Just peel off the protective back sheet and press the new insert onto the tile. That’s it! Graphictrax tile is another new addition and based on the same design concept as Vinyltrax. What Swisstrax does is print an image or logo of your choosing directly onto one or more vinyl inserts depending on image size. They have thousands of images, colors, and logos for you to choose from or you can provide your own high resolution logo or image for them to print. It’s an excellent way to personalize your garage and give a custom touch that you can’t get with most other garage flooring. You will need to contact Swisstrax for pricing and to gain access to the images that they have available. 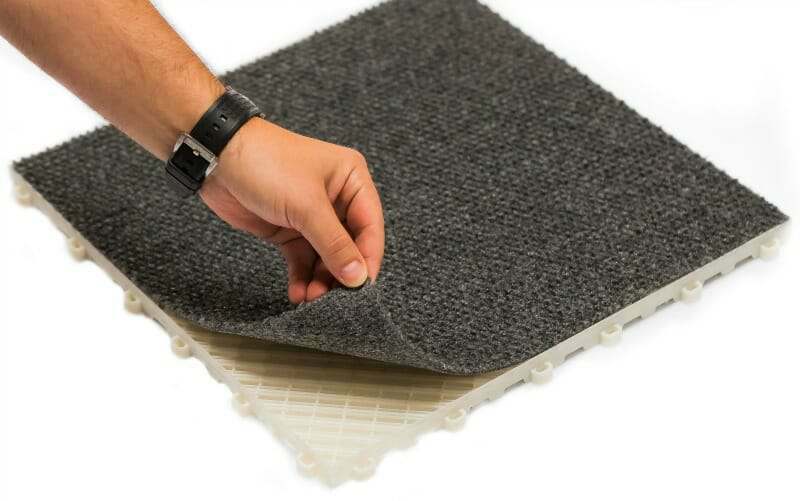 RaceDeck claims to be the innovator of the first plastic interlocking carpet tile and it’s been an established option for years now in their lineup. Swisstrax has finally followed suit with their version called Carpetrax. Built on the same Vinyltrax style platform, Swisstrax uses a carpet insert instead of vinyl. They are available in Dark Grey, Light Grey, and soon to be released, Red. As like the vinyl inserts, if you damage or stain the carpet it can be replaced with a new carpet insert instead of the complete tile. 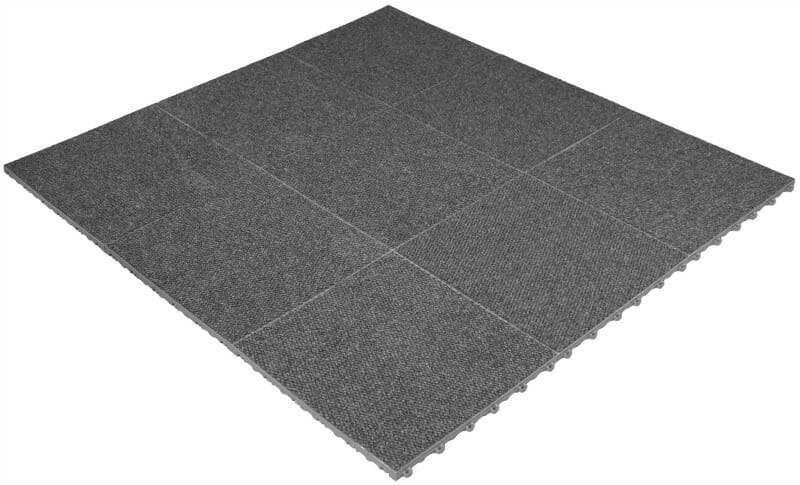 Carpet interlocking tile is actually quite popular to use in office areas of the garage. We have also seen it used for game rooms as well as the laundry area of a garage, and as runners between parked vehicles. As we had stated before, our biggest gripe about Swisstrax had to do with the fact that the larger Ribtrax tile could not be interlocked with any other tile in their lineup due to its larger size. This was particularly annoying since one very popular option with consumers of interlocking garage flooring is to create a mix of the self-draining tiles with the very popular solid top, diamond tread tile designs. Knowing that this was an issue that often came up when discussing tile options with potential customers, Swisstrax has finally introduced a revised edition of their Diamondtrax tile that is compatible with the Ribtrax tile as well. 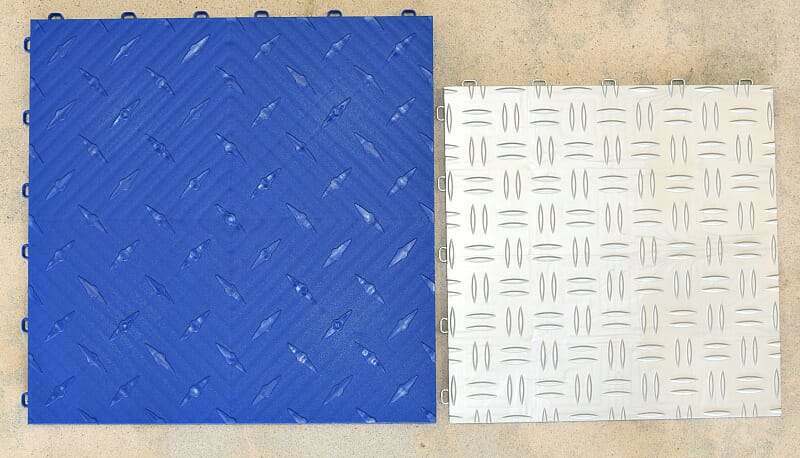 Like the other tiles we have reviewed, this new Diamondtrax design is 15.75”x15.75” and .75” thick and it incorporates the more traditional diamond tread pattern. The top of the tile has an etched finish to it that aids in traction and the Diamond treads have a satin finish that adds a nice contrast. Available right now in seven different colors with more on the way, you can finally integrate Swisstrax’s two most popular tile designs together in order to create a more functional flooring layout based on your needs. How Strong are Swisstrax tiles? Plastic interlocking garage tiles are much stronger than most would think. Plus, Swisstrax has a .25” advantage in thickness over the competition with most of their tiles. They report rolling load ratings up to 70,000lbs depending on the style of tile. 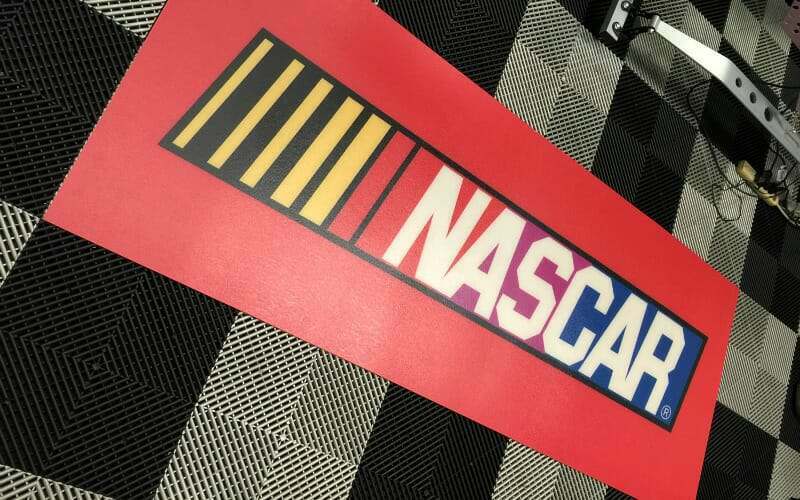 These were the highest ratings available until RaceDeck recently upped their ratings to 80,000lbs without any design changes that we are aware of. The point we want to make is that unless you plan on parking a tank in your garage sometime in the near future, load ratings should be of no concern. What you should be aware of is that any load that you place on the tile should not have an extremely small surface area. Strong underside support structure. The two Vinyltrax tiles are on the left. Ribtrax is top right and Diamondrax bottom right. For example, if you place a car on jacks stands that have the narrow angle iron legs, you will most certainly dent the tile if not damage it due to the high load on such a small ¼” wide footprint. However, if you place the same car on jack stands that have a flat 2” square surface area for each leg, the load is then spread out much better and they will not affect the tile. The same goes for very heavy work benches and storage cabinets. As long as they have a round or square flat foot, it’s very hard to damage these tiles. They will support the load quite well. We also want to point out that the .25” taller tiles also have a much better airflow design on the underside than the previous 13”x13” tiles that are .50” tall. The taller design allows for larger channels that increase airflow as well as water drainage. This is what helps to keep the concrete dry underneath and prevents any issues with mold or mildew under the flooring, particularly if your concrete has moisture problems. How much does Swisstrax cost? As we stated, Swisstrax is a premier garage flooring tile and the price of their product reflects that. Depending on sales, the Ribtrax and Diamondtrax tiles are in the $4 per square foot range while the Vinyltrax tiles are closer to $6 per square foot. This also includes a 15 year warranty against manufacturer’s defects. Though more expensive than most of their competitors, it doesn’t mean it’s not a good value. We imagine a good part of the additional expense for Swisstrax over their competitors has to do with their tiles being .25” thicker. That is a 50% increase in the amount of materials per tile that is being used. Swisstrax is also a direct to buyer flooring company. You can’t find their name brand product at a retail outlet or flooring vendor online. They sell direct to the consumer. The first thing they ask when you inquire about pricing or application is to connect you with a Swisstrax employee representative for your area. The reason they do this is to provide the best service possible to make sure that all your questions are addressed and that you are completely satisfied with their service. They also back that with a 30 day money back guarantee for all tiles that are in re-useable condition. Swisstrax is a very forward thinking company that has contributed greatly in the recognition and fast growing success of the interlocking garage tile market. One of the most important issues we believe that they have addressed is to integrate the majority of their interlocking tile lineup with their most popular tile, Ribtrax. We feel that this has always been a small sore spot that had to be overcome when people discussed Swisstrax as an option. They have also upped the ante for their competition by introducing these exciting new styles. It’s obvious to us that Swisstrax is trying to create a new perspective in regards to how people think garage flooring should look. We have high praise for any manufacturer willing to do that. If you are planning to install interlocking tiles for your garage floor, then Swisstrax should be high on your list of companies to look at. Give them a call and talk to one of their representatives about how you plan to use your garage. Finally, be sure to have them send out a free sample to you. You can also purchase additional samples that they will credit back to you upon purchase of their flooring. This way, you can do your own review of Swisstrax garage tiles and ultimately decide whose tiles are best for you. Why Do My Garage Floor Tiles Make Noise?